Based on the popular animated TV series "Ben 10" by the Cartoon Network, Ben 10 once again returns to the console world that follows Ben Tennyson and his cousin Gwen as they attempt to recover pieces of alien technology that have been hidden across the planet in order to locate their missing grandfather called Max. 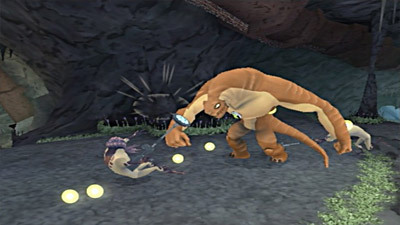 Solid and Robust Gameplay – Explore action-packed levels and secret sections in arcade-style gameplay as you clash with more than 20 types of enemies; use more than 75 attack options and create unlimited attack chaining with the streamlined combo system; engage in two-player co-op on PlayStation®2 computer entertainment and Wii for hours of fun and replayability. Based On a Successful Television Franchise – As one of Cartoon Network’s breakout original franchises, the BEN 10: ALIEN FORCE television series is in its first season as a top-rated show, and is the next generation continuation of the phenomenally successful and Emmy-winning Ben 10 original series. 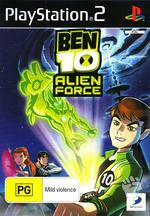 A long form television movie based on BEN 10: ALIEN FORCE will debut on Cartoon Network in fall 2008. Fortunately for Ben and Gwen, they are joined with their friend Kevin who will assist them in this mystery. To compound the situation for our young heroes, a nefarious plumber called Gorvan may be the key to this mystery in this classic arcade fighter than will have younger gamers clamoring for more. At its core, Ben 10: Alien Force is your traditional arcade game with a healthy dose of combat with your main character being that of Ben Tennyson who has the ability to transform into five different aliens thanks to the Omnitrix. Although you spend much of the time duking out with the HighBreed, there is also a healthy dose of puzzles that must be solved in order to progress through the game. 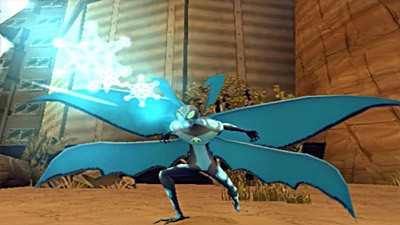 Even though you can interact with the gaming environment with just Ben alone, where the title does shine is by using the various alien forms (Swampfire, Bill Chill, Spidermonkey, Jet Ray and Humungousaur), each with their own unique powers and of course weaknesses. The various creatures that you control are quite fun at times and really assists with the overall gameplay of the title which is oozing with Ben 10 references. The only trick aspect of this is that each of the aliens have different combos which means for some younger gamers, this may be a tad difficult to master, however older gamers should have no difficulties. You can also play the game with another player, for those who like multiplayer outings. Graphically the title at times looks like a Ben 10 cartoon, however the title does suffer from polygon clipping, especially in battles. The characters are well animated as are the detailed gaming environment which does pay homage to the cartoon series. The music score is quite ambient at times and does change with the gameplay and thankfully the sound effects are quite powerful and assist in the overall enjoyment of the title. In conclusion, Ben 10: Alien Force may suffer from a few bugs here and there, however these are far and few. Please keep in mind that this game is aimed at the younger market so older gamers may want to look elsewhere, however for others, this may be the perfect escape.